Performance metrics that allow for comparison of performance across transportation modes. The legislation directs ODOT to use these metrics to assist with statewide strategic planning processes and investment decisions (exact language can be found in Sec. 5501.08 of the transportation budget). With this new language, Ohio will be joining other states, such as Pennsylvania and North Carolina, in utilizing metrics to guide transportation investment. This provision should help public transportation compete for additional funding. Joint Legislative Task Force on Transportation Issues. Throughout the legislative process, GOPC championed the creation of a task force that would analyze transportation funding. This Task Force has a broader focus, but must report by December 31, 2016 on the funding needs and recommendations for funding transportation. There is significant bi-partisan support for this Task Force (the exact charges of the Task Force can be found in Sec. 775.40). This Task Force creates an opportunity to further explore funding options for multi-modal and public transit. GOPC thanks the Legislature for considering these provisions and incorporating them into the final budget that went to the Governor. Without support from key legislative champions, these provisions would not have been signed into law. Click here to see the final transportation bill (follow the link for "Transportation and Public Safety Budget FY2016 and FY2017"). On Monday, Governor Kasich signed House Bill 487—also known as the Mid-Biennial Review Bill [MBR]—including a $42 million allocation for the Clean Ohio Fund. Greater Ohio would like to thank the General Assembly and Gov. Kasich for supporting the Clean Ohio Fund, which contributes to the quality of life and economic development of many Ohio communities. The MBR, subtitled the Management Efficiency Plan (MEP), is a new effort by Gov. 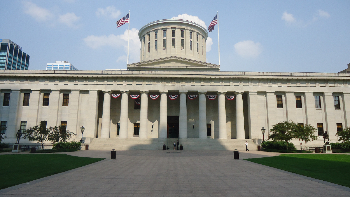 Kasich and the Ohio General Assembly to evaluate and refine Ohio’s $55.7 billion budget at the midpoint of the two-year budget cycle, as opposed to solely at its conclusion. The stated purpose of the MEP is to “streamline operations, reduce costs and improve delivery of services for Ohio taxpayers.” The Governor used his line-item veto authority multiple times, but he kept appropriations for Clean Ohio Fund intact. The Clean Ohio Fund is a state fund authorized by Ohio taxpayers in 2000, and again in 2008, to support brownfield revitalization, farmland preservation, green space conservation, and recreational trails. The allocated $42 million will be shared between Clean Ohio’s Green Space Conservation and Farmland Preservation programs. Communities can apply for the Clean Ohio funding, which requires a private match of 25-50 percent, and then applicants are scored and peer reviewed in a competitive process so that only the most qualified projects are ultimately funded. Private organizations and local communities become the owners of the projects and they are responsible for ongoing maintenance and improvement costs. Since the upfront cost of land is often prohibitive, the Clean Ohio Fund allows communities to protect land that they might not have been able to otherwise. Funding for Clean Ohio Fund’s Brownfield Revitalization Program has been retained (likely at $42 million). However the specific design of the Brownfield Revitalization Program is still under discussion at JobsOhio, which will be administrating brownfield revitalization. Ohio voters overwhelmingly support all programs in the Clean Ohio Fund (70 percent/30 percent in 2008 in all 88 counties) because they contribute to economic and community development. Clean Ohio helps support economic development and job creation by making our communities more attractive to businesses and individuals looking for a high quality of life. We are grateful to the Governor and General Assembly for approving this program.